326 records – page 1 of 7. 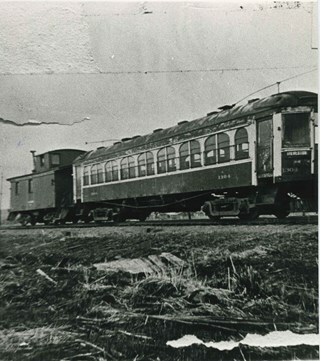 Photograph of a British Columbia Electric Railway Company train, just west of MacPherson Ave, on the Central Park Interurban line. 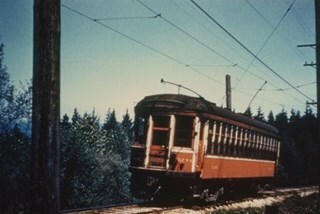 Photograph of the L.6BCER, a British Columbia Electric Railway line car, used to repair overhead power lines along interurban tracks. Photographed near Jubilee Station, between Imperial and Nelson. Photograph of a BC Electric Railway timetable for the Lulu Island Branch, Eburne, and New Westminster Line, including a Sunday schedule and freight schedule. For an earlier donation made by the same donor in regards to BCER tram, see accession HV972.202. Photograph of two British Columbia Electric Railway Company timetables for the Central Park line, one "corrected to October 15, 1933" and the other "corrected to May 16, 1946." 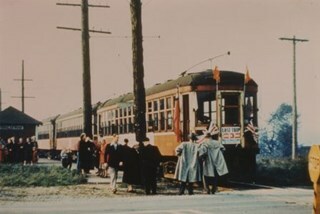 Also in the photograph are two tickets, one reads, "Good for one fare at 10 for $1.25 between Vancouver and Burnaby Northwest Zone" and the other reads, "Good for one fare between Vancouver and Park Ave."
Photograph of the exterior of the British Columbia Electric Railway Company Interurban tram no. 1223 at a station. There are people standing by the tram, and a conductor is climbing onto the tram from the front. An annotation on the back of the photograph reads, "BCER 1223 (1232 in background) / Marpole BC / Oct. 57." Item is a thirty-nine page booklet describing and illustrating British Columbia Electric Railway Company operations and development in the Lower Mainland between 1910 and 1923. 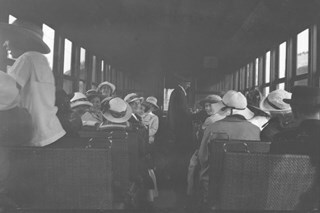 Photograph of the interior of a Central Park Interurban tram, including passengers, the majority of whom are women. 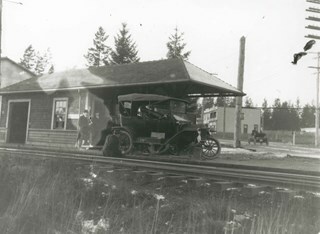 Photograph of an automobile at the Edmonds Interurban Station. A man appears to be changing the car tires, and three men are on the station platform. 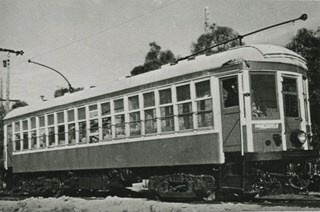 Photograph of Interurban tram no. 1225 at Marpole Station. "B.C. Electric Ry. Co." is written along the top of the tram. 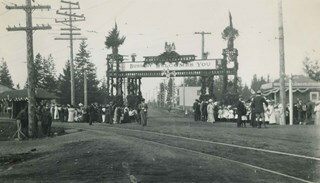 Photograph of the welcome arch erected at Edmonds and Kingsway to welcome Prince Arthur, Duke of Connaught during his visit to Burnaby. People are lined up on either end of the arch, dressed in their finery. The interurban tracks can be seen in the foreground and the Edmonds station can be seen at the far right decorated with bunting. Prince Arthur was Governor General of Canada at this time. 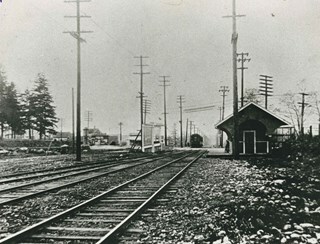 Photograph of the Patterson Avenue Interurban station (the two shelters in the centre of the photograph). There are fences in foreground and Central Park can be seen in the background. There is snow. An annotation on the back of the photograph reads, "Patterson Interurban Station / B.C. Electric." 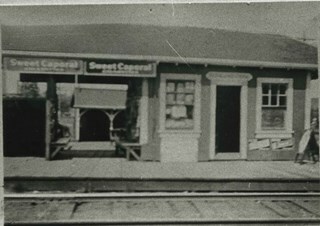 Photograph of Grace (nee Dommet) and Lionel "Judge" Thould's "dinky" store at Highland Park Interurban station on the Central Park Interurban line. Photograph of a special chartered interurban tram used to take people to the Dundonald United Church annual picnic at Second Beach, Stanley Park. 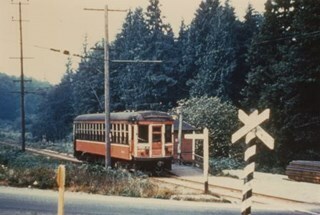 The tram is pictured at MacPherson station, at MacPherson Avenue and the British Columbia Electric Railway tracks. Photograph of Interurban trams at Central Park station. The British Columbia Electric Railway Company ran one-, two- and three-car "trains." 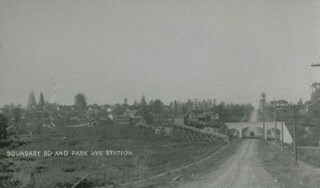 The photograph was taken from the park, looking west toward Kingsway. Photograph of Connaught Hill station on the Central Park Interurban right-of-way at 10th Avenue. To the right, a spur line to the gravel pit used as ballast on tract beds near the Stride garbage dump. The Skytrain maintenance centre was later located there. 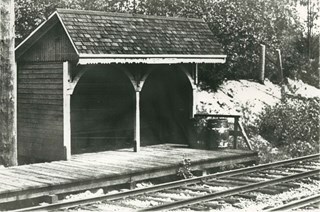 Photograph of Fraser Arm Interurban station at Gilley Avenue. Lyle Le Grove became a British Columbia Electric Railway buff because his father worked at the British Columbia Electric Railway New Westminster maintenance depot for many years. 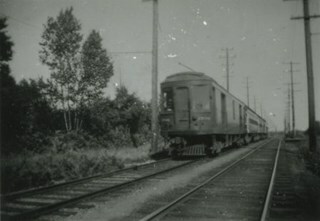 Photograph of New Westminster British Columbia Electric Railway depot freight train en route to Chilliwack. This location at 8th and Columbia was the hub of the interurban network with Fraser Valley, Marpole, Central Park, Burnaby lake trams and trains all going through. Later, the building served as Wosk's store and then as a market. Photograph of Central Park Interurban trams at Royal Oak Station. Jimmy Strachan, the motorman, is not visible. 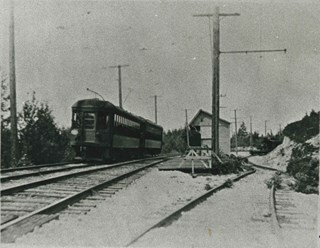 Photograph of a Burnaby Lake Interurban tram, eastbound for Sapperton, at Great Northern Railway crossover. 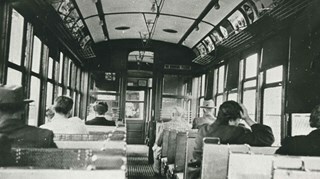 Photograph of a Burnaby Lake Interurban tram interior. 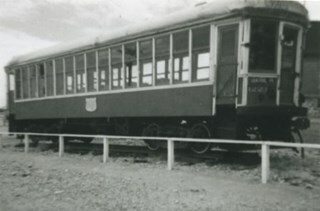 Photograph of the Duke of Connaught's Interurban tram, called that because the Duke used it on visit to British Columbia as Governor General of Canada. 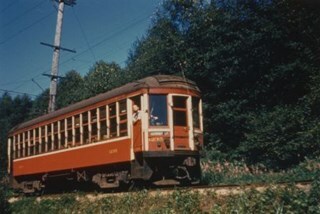 It was used on the Central Park Interurban line and on the Chilliwack run. 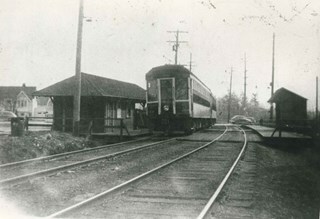 Photograph of Leeside Interurban station on the Central Park line. Reuben Butcher (father of Violet Butcher Lynds) walked to here to catch the tram to work at B.C. Sugar in Vancouver. Lanterns used by passengers walking to and from the station during dark winter mornings and evenings were left under the wooden floor of the station. 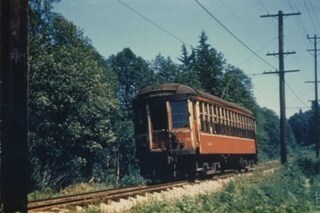 Photograph of the exterior of British Columbia Electric Railway (BCER) line Tram no. 1309. 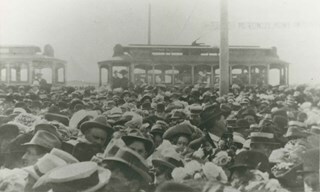 Photographic postcard of a crowd gathered near a tram car at Edmonds and Kingsway during Prince Arthur, the Duke of Connaught's visit to Burnaby. A Union Jack is hanging from one of the windows of the triangular Edmonds Block, which is visible in the background. The Duke of Connaught was Governor General of Canada at this time. 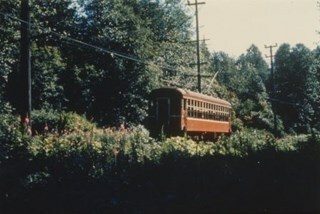 Photograph of Tram #1234 on the Burnaby Lake Interurban line, near Stormont station. 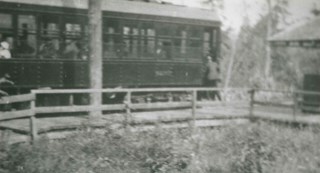 Photograph of Tram #1228 on the Burnaby Lake Interurban line, near Stormont station. Photograph of the caboose of Tram #1233, on the Burnaby Lake Interurban line, near Cariboo station. 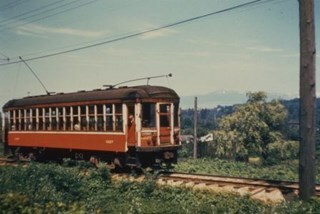 Photograph of Tram #1235 on the Burnaby Lake Interurban line, near Cumberland Road station. The tram conductor can be seen poking his head out of the side door as he drives. 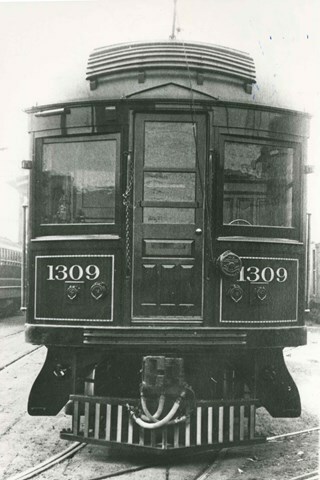 Photograph of Tram #1231 on the Burnaby Lake Interurban line, near Stormont station. Photograph of Tram #1230 on the Burnaby Lake Interurban line, at Cariboo station's level crossing. 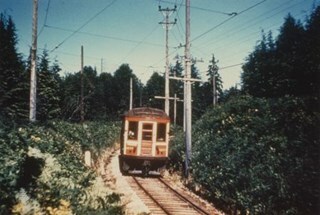 Photograph of Tram #1227 on the Burnaby Lake Interurban line, near Murrin station. 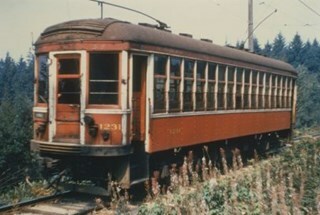 Photograph of Tram #1236 on the Burnaby Lake Interurban line on the last day of its run. 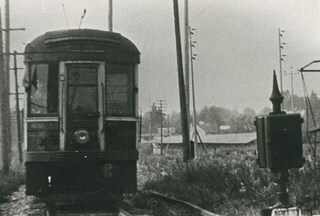 Photograph of a tram on the Burnaby Lake Interurban line, on the last day of the Burnaby Lake run. 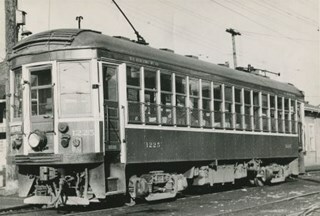 Photograph of British Columbia Electric Railway Company tram 1223. 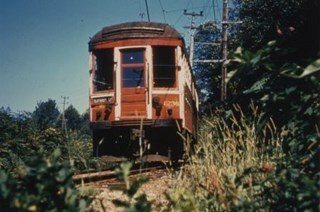 Photograph of British Columbia Electric Railway Company tram 1223 parked at Edmonds Loop. The no. 52 Nelson bus stop is visible on the right-hand side. 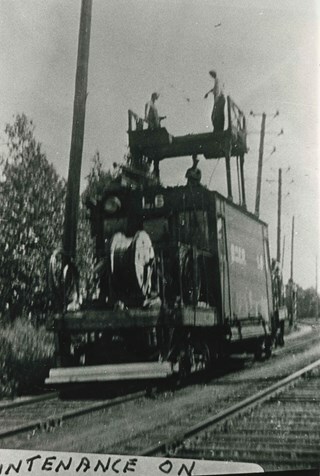 Photograph of British Columbia Electric Railway Company tram 1223 being moved from Edmonds Loop to Burnaby's Centennial Heritage Village, where it became a permanent archive. A man looks on as a railworker moves under the tram just as two large cranes lift it into the air. Newspaper clipping glued to verso of photograph reads: "It took two cranes and about three hours to transport old B.C. Electric inter-urban tram car from it's former home at Edmonds Loop to it's new home at Burnaby's Centennial Heritage Village. Tram is to be a permanent archive at the village. 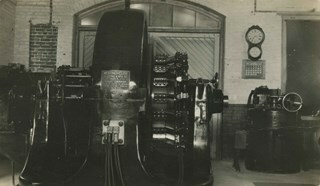 Photographic postcard of the British Columbia Electric Railway Company's Burnaby Substation that was built in 1903 and put into operation to receive and distribute power from the B.C.E.R. Buntzen Lake power dam. The electric lines came across the inlet at Barnet, along the Barnet-Hastings Road to Sperling Avenue (built for this project and called Pole Line Road) and then south to this site at the corner of Griffiths and the old Central Park interurban line (later this section was called the Highland Park line). This substation was constructed to convert the alternating current being delivered from the Buntzen power plant to direct current for the operation of the tram cars operating on the Central Park interurban route. The new brick substation replaced the wood fed steam powered 1891 Powerhouse that operated south of this site, across the tracks until its closure on May 31,1905. It was demolised in the late 1920s. This brick substation originally known as the Burnaby Substation, eventually became known as the Newell Substation. The original brick building was replaced by a new structure in 1930, which was demolished in the 1960s in favour of the open field substation that continues to operate on the same site today at 7260 Griffiths Avenue. 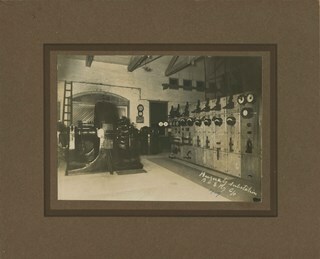 Photographic postcard of the interior of the British Columbia Electric Railway Company's Burnaby Substation that was built in 1903 and put into operation to receive and distribute power from the B.C.E.R. Buntzen Lake power dam. The electric lines came across the inlet at Barnet, along the Barnet-Hastings Road to Sperling Avenue (built for this project and called Pole Line Road) and then south to this site at the corner of Griffiths and the old Central Park interurban line (later this section was called the Highland Park line). This substation was constructed to convert the alternating current being delivered from the Buntzen power plant to direct current for the operation of the tram cars operating on the Central Park interurban route. The new brick substation replaced the wood fed steam powered 1891 Powerhouse that operated south of this site, across the tracks until its closure on May 31,1905. It was demolised in the late 1920s. This brick substation originally known as the Burnaby Substation, eventually became known as the Newell Substation. The original brick building was replaced by a new structure in 1930, which was demolished in the 1960s in favour of the open field substation that continues to operate on the same site today at 7260 Griffiths Avenue. 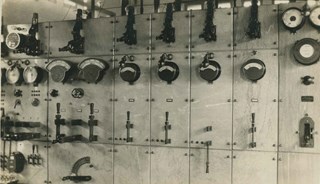 Photograph of the interior of the British Columbia Electric Railway Company's Burnaby Substation that was built in 1903 and put into operation to receive and distribute power from the B.C.E.R. Buntzen Lake power dam. The electric lines came across the inlet at Barnet, along the Barnet-Hastings Road to Sperling Avenue (built for this project and called Pole Line Road) and then south to this site at the corner of Griffiths and the old Central Park interurban line (later this section was called the Highland Park line). This substation was constructed to convert the alternating current being delivered from the Buntzen power plant to direct current for the operation of the tram cars operating on the Central Park interurban route. The new brick substation replaced the wood fed steam powered 1891 Powerhouse that operated south of this site, across the tracks until its closure on May 31,1905. It was demolised in the late 1920s. This brick substation originally known as the Burnaby Substation, eventually became known as the Newell Substation. The original brick building was replaced by a new structure in 1930, which was demolished in the 1960s in favour of the open field substation that continues to operate on the same site today at 7260 Griffiths Avenue. 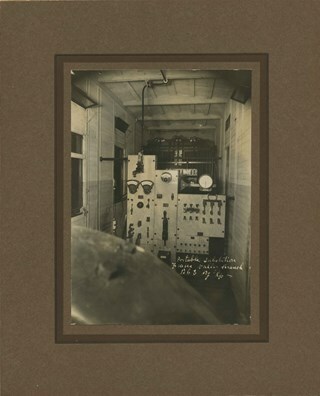 Photographer's handwritten note (on the negative causing it to show) on recto of photograph reads: "Burnaby Substation/ B.C.E.R.C/O"
Photograph of the interior of the portable "railcar" substation at the British Columbia Electric Railway Company's Fraser Valley Branch. 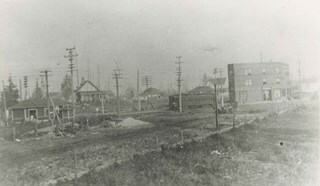 Photograph of Boundary Road, Park Avenue Interurban station, and the surrounding area, looking north from Kingsway. The Coburn house, built in 1906, is at the top of the hill on the right, current address 5170 Boundary Road. 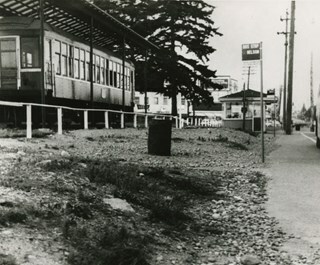 Annotation at bottom of photograph reads; "Boundary Rd and Park Ave Station"
Photograph of a tram on the Burnaby Lake Interurban line at the Cumberland Road station. Photograph of Central Park Interurban line, tram no. 1223. 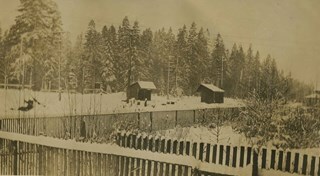 Photograph of the Burnaby Lake Interurban in the snow. The house in the background is 2231 Fareham Street, a short street that ran behind Elwell and the tram tracks about midway between the Cumberland Road and Hill Street Stations. This rail line route is now the route of Highway 1 through Burnaby. The uppermost window in the house was the donor's bedroom. 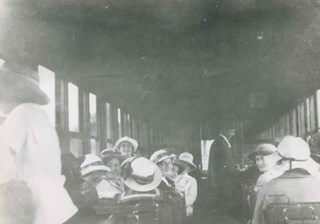 Photograph of the interior of a Central Park interurban while it is in service. Photograph of the area near the Edmonds and Kingsway intersection. A British Columbia Electric Railway Company tram is visible in the centre and the station can be seen to the left. 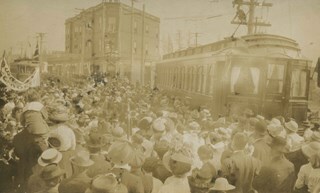 Photograph of a large crowd gathered near Edmonds and Kingsway to welcome the Duke of Connaught during his visit to Burnaby. 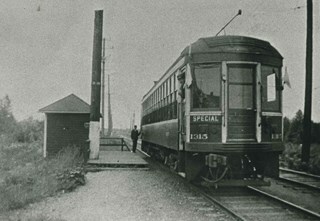 Two interurban cars can be seen in the background. The Duke of Connaught was Governor General of Canada at this time.